Program: Designed for children who are new to playing a sport or new to playing badminton. Focus is on teaching the fundamentals of badminton, rules of the game, applicable badminton terminologies and basic skill sets. Prerequisite: Satisfactorily completed the BBTA Beginner Class and/or with Coaches’ Recommendation. Program Description: Designed for studentss who had previously attended clinics or training sessions for beginners and/or have learned the sport via games played occasionally for fitness or small group competitions (e.g. friendly matches). Prerequisite: Satisfactorily completed BBTA Intermediate Class and/or with Coaches’ Recommendation. Program Description: Designed for students who frequently join tournaments or are focused on participating in badminton competitions; must have satisfactorily completed intermediate training e.g. school, club training. Skills and techniques are honed for competitive play. Practice sessions will be intense. 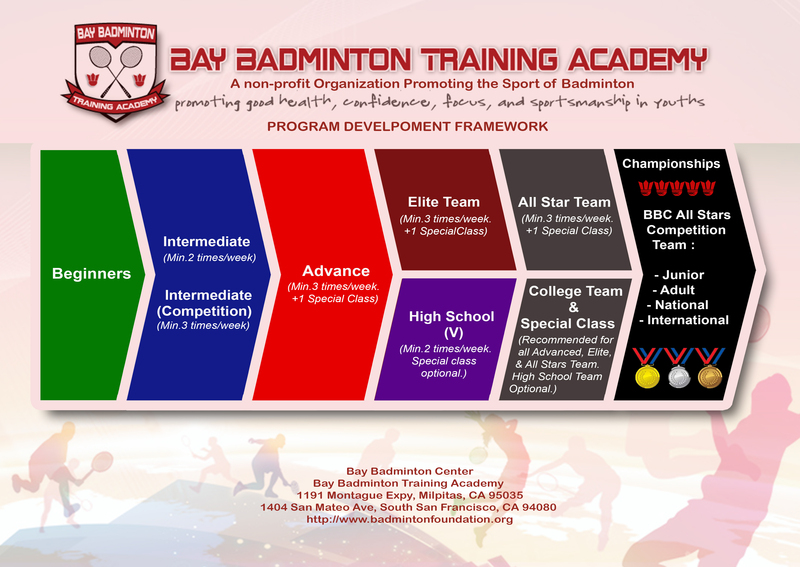 Program Description: Designed for youths who wish to participate in high school/college badminton teams. Prerequisite: Satisfactorily completed BBTA Advanced Class and/or with Coaches’ Recommendation. Program Description: Designed for students who are tournament players or are focused on participating in high level badminton competitions; must have satisfactorily completed Advanced training. Skills and techniques are honed for high level competitive play. Practice sessions will be intense. Program Description: Designed for tournament players or those who plan to participate in specific high level competitions; must have undergone intermediate training (e.g. school, club training). Training will include additional on court/off court exercises; sessions will focus on improving Skills and Techniques to meet higher level/competitive level play. Practice sessions will be intense.